Home Gun Safe Guide	Best Travel Gun Safe – The Key Features! Do you worry about your security while travelling? For some people, their job or the amount of money they carry around means that this is a risk that they need to think about. Are you specifically at risk of being assaulted or do you fret about personal safety in general? The simplest solution can be to carry a handgun. This is an effective way of increasing your personal security wherever you go. It is an option that more and more people are turning to in a bid to stay safe in these dangerous times. Yet, few of us want to carry a gun in our pockets, do we? What if it goes off accidentally? Or you lose it? Or a criminal grabs it off you? This is why we need to find somewhere secure to store it when we are far from home and the office. A travel gun safe can be the ideal solution, provided that you understand what exactly you need. 1 What Do You Want from This Safe? 2 How Might You Use It? 3 What Features Are Most Important? 4 Are There Any Drawbacks? 5 How to Make a Smart Choice? 6.1 The Elephant E120 Safe! 7.1 Are travel gun safes less secure than bigger models? 7.2 Does any type of gun fit into them? 7.3 Can I take it on a plane with me? 7.4 Is it legal to use one? What Do You Want from This Safe? Every type of gun safe on the market has different pros and cons. This is because they all designed for varying situations and uses. You need to decide which one is perfect for you. So, what do you want from a travel gun safe anyway? As with any other kind of safe, you want it to be tough and really difficult to break into for starters. A flimsy safe that can be easily opened isn’t worth the bother. However, you also need it to be fairly small and light as well. If you are going to be taking it out with you then you definitely don’t want a huge, bulky thing that weighs you down. This is especially true if you need to be mobile an agile for your job. Maybe you want to keep it in your auto’s glove compartment? In this case, you will want it to be the right size to fit in snugly. You also don’t want the gun inside to get damaged while you carry it around. Therefore, it needs to be heavily padded on the inside and durable on the outside. It is clear that everyone who uses a handgun safe like this has different reasons for doing so. Some people report that they put it in with their hold luggage when travelling by air. This is essential, as the TSA regulations state that firearms need to be securely packed when in transit on a plane. Others will travel with their gun safe in their car. You might even just carry it around with you like a briefcase. Of course, you can also use this safe at home by putting it in your nightstand or under your bed. The versatility on offer is one of the main reasons for choosing a travel gun safe like this. You can use it in a number of days as your circumstances change. There are some features that might be especially important to you. This really depends upon your own preferences and also how you prefer to use it. A comfortable handle. If you are going to be carrying this travel gun safe a lot of the time then a comfortable handle is essential. The type of lock. A gun safe is only as good as the locks that it uses. In some cases, a lock it already fitted, while others allow you to fit one or more padlocks to them. The size. The majority of small travel safes really only fit one handgun or pistol. If you need to carry around more than this you will need to look at the bigger models on the market. The internal padding. How thick is it? How easy is it to customize? If you feel that the safe is going to get thrown about a lot then this is particularly important. We have seen by now that a good travel gun safe can be a smart purchase for a number of situations. Yet, you may wonder whether there are any possible drawbacks that you need to take into account when thinking about buying one. If you definitely need to take a gun out with you then this is the type of safe that you need. But, if you are only going to be using it at home then a different kind of model might suit you best. Would a wall-mounted gun safe or an under the bed model be better for you? The ease with which this safe can be picked up and carried away means that leaving it around your home isn’t always the ideal approach. It is for a very good reason that these are known as travel safes. Another point to consider is whether you really need to take a gun outside in the first place. Could this make you a target for criminals and increase the risk instead of decreasing it? How to Make a Smart Choice? If you are ready to buy your new gun safe then you are sure to be excited about it. This is the sort of purchase that is fun to make as well as being extremely sensible too. The last remaining question is around how to make a smart choice. How do you end up with the best travel gun safe for your needs and budget? The starting point has to be with the size of the gun and how many guns you want to keep in your safe. If you have only 1 small firearm then you can take your pick from just about any model you find. The weight is also important to a lot of people. Some of us like the reassurance of a heavy gun safe, while others prefer a lightweight model that is easy to move around. Looks are also important to some people. Do you want a no-nonsense safe, an attractive one, or perhaps one that looks highly professional? There are plenty of models around that you can use when you travel. So, which one is best for your needs? We really like the Elephant E120 Handgun Pistol Hard Case for Small to Medium Gun. 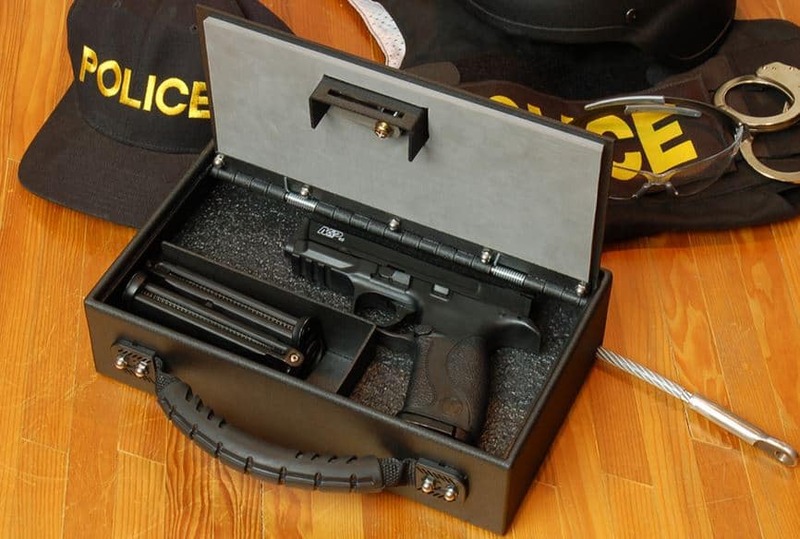 This is a compact but robust gun safe that you can take anywhere with you. It fits a variety of handguns, pistols and revolvers inside it. The inner dimensions are listed as being 8.81″ x 6.37″ x 3.77″. So, not every small gun fit in here. A few of the models that you can store in here include the Glock 19 , Sig Sauer P226 , Smith & Wesson M&P under 8. It has been built using stainless steel and you have the choice of putting either 1 or 2 padlocks on it. We also like the fact that there is a limited lifetime warranty on this travel gun safe. It is nice and tough, so you don’t need to worry too much about how you treat it out on the road. It is also good to see that internal foam is easy to cut into shape. This means that you can customize it to your needs very simply. The handle is very comfortable to hold too, so you won’t need to worry too much if you need to carry it about a lot. Are travel gun safes less secure than bigger models? It stands to reasons that they safes aren’t as tough as big, reinforced gun safes. However, the best ones are solid enough to keep your firearms out of harm’s way. A determined, experienced thief can probably break it open eventually, though. Does any type of gun fit into them? No, these are small safes that only have room for certain handguns and pistols. You should be sure to check the exact specifications on any model you are interested in buying. Can I take it on a plane with me? Many gun owners have reported taking their guns on flights with absolutely no problems. Naturally, it will need to go in the checked hold luggage rather than in the cabin with you. In fact, TSA regulations say that your gun needs to be in a locked, hard case. You might like to check with the airline in advance, though. Is it legal to use one? You should remember that in the California penal code, firearms need to be carried in a locked container. In this case, a secure gun safe meets the requirements. In other parts of the country, or elsewhere, you might want to check the local legislation in advance. When you choose the best travel gun safe for your needs, it gives you a tremendous amount of security when you are away from home. This can be vital in making you feel comfortable in awkward situations. Of course, to truly stay safe you need to make a smart choice of safe. Take into account the factors we have looked at here and you will be just fine.